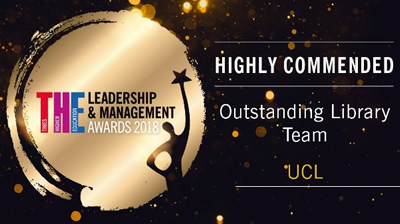 UCL Library Services gained recognition as an "Outstanding Library Team" in this year's Times Higher Education Leadership and Management Awards. The awards (known as THELMAs), saw UCL being highly commended. For 2018, the 10th anniversary of these national awards, there was stiff competition from other institutions, with 8 libraries shortlisted in 2018, including the London School of Economics and Political Science. The winners were the White Rose Libraries Consortium (Universities of Leeds, York and Sheffield) for their collaborative work on a repository service (White Rose Research Online) and an online press. The consortium's joint management of print holdings was also considered to be of national importance. The UCL Library Team was highly commended for the second time in three years for "all-round excellence and strategic commitment to open access". A delegation from the Library Services Leadership Team attended the awards ceremony on 21st June 2018.
" "Great recognition of the outstanding UCL Library… It is wonderful to know we have such a strong and respected division in UCL." Reaching 65% of all taught courses on our ReadingLists@UCL service- the highest coverage rate amongst our research-intensive peers. UCL has grown its digital library to suit demand with Patron-Driven Acquisitions. Use of e-books increased by 45% in 2017 alone. The 11th Annual Library Services Staff Conference on the theme of Customer Service Excellence. Exceeding 50 publications and 1 million downloads from UCL Press since its launch in summer 2015. That is an amazing achievement for a young Press, which is helping to re-define the meaning of academic publishing. As noted in the submission to the awards, "UCL Library Services represents an outstanding community of professionals, dedicated to enhancing the user experience and developing new publishing models which open up the knowledge and wisdom of UCL research and teaching to a global audience". This commendation is one which acknowledges the collective strengths and hard work of colleagues throughout UCL Library Services, to deliver one of the finest library services in the UK.